Erfurter has big orange double blossoms that are high in carotenoids and flavonoids. The attractive flowers appear about 10 weeks after planting and continue into the fall. Direct sow in spring any time up to Solstice, 6 mm (1/4 in) deep in sun or part shade. Thin to 15 cm (6 in) apart. Germinates in 5 - 15 days and grows to 45 cm (18 in) tall. Deadhead flowers if you don't want calendula to self-sow. Erfurter is a good choice for using in salves. After picking the blossoms, leave them outside for a few hours so that any critters have a chance to escape - we generally see tiny thrips on ours. Dry in a dehydrator at low heat. 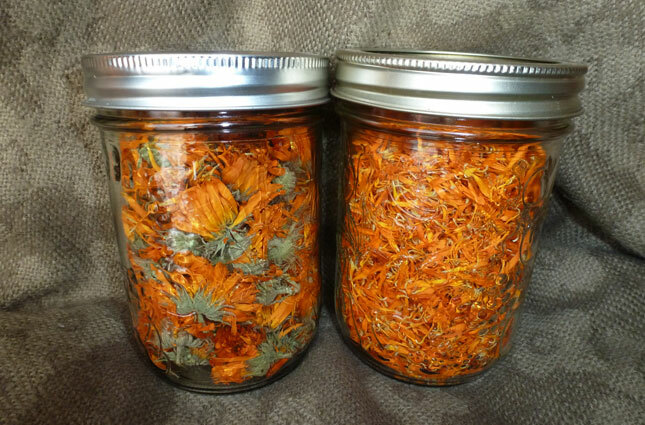 Soak dried petals or flower heads covered in extra virgin olive oil in a sealed jar in a warm dark spot. Let it sit for a month or two, shaking regularly, then strain and use in your favourite recipes.